A baronet ( /bærənɪt/ or /bærənɛt/; abbreviated Bart or Bt) or the rare female equivalent, a baronetess ( /bærəˈnɛtɛs/; abbreviation "Btss"), is the holder of a baronetcy, a hereditary title awarded by the British Crown. The practice of awarding baronetcies was originally introduced in England in the 14th century and was used by James I of England in 1611 as a means of raising funds. A baronetcy is the only British hereditary honour that is not a peerage, with the exception of the Anglo-Irish Black Knight, White Knight and Green Knight (of which only The Green Knight is extant). A baronet is addressed as "Sir", just as is a knight (or "Dame" in the case of a baronetess), but ranks above all knighthoods and damehoods in the Order of precedence, except for the Order of the Garter and the Order of the Thistle (and the dormant Order of St Patrick). Baronets are not formally deemed noble, although they are widely regarded as being members of the aristocracy. In Europe their social rank is roughly equivalent to petite noblesse. The term baronet has medieval origins. Sir Thomas de La More, describing the Battle of Boroughbridge, mentioned that baronets took part, along with barons and knights. The baronetage is of far more ancient origin than many people may think. The term baronet is believed to have been first applied to nobility who for one reason or another had lost the right of summons to Parliament. The earliest mention of baronets was in the Battle of Battenberg [sic], in 1321. There is a further mention of them in 1328 when Edward III is known to have created eight baronets. Further creations were made in 1340, 1446 and 1551. At least one of these, Sir William de La Pole in 1340, was created for payment of money, presumably expended by the King to help maintain his army. It is not known if these early creations were hereditary but all seem to have died out. The present hereditary Order of Baronets in England dates from 22 May 1611 when it was erected by James I who first granted Letters Patent to 200 gentlemen of good birth with an income of at least £1,000 a year. His intention was twofold: firstly he wanted to fill the gap between peers of the realm and knights so he decided that the baronets were to form the sixth division of the aristocracy following the five degrees of the peerage; secondly, and probably more importantly, he needed money to pay for soldiers to carry out the pacification of Ireland. Therefore those of the first creation, in return for the honour, were each required to pay for the upkeep of thirty soldiers for three years amounting to £1,095, in those days a very large sum. In 1619 James I also established the Baronetage of Ireland and set out plans for a new baronetage to assist with the colonisation of Nova Scotia. However in 1624 King James died before this could be implemented. In 1625 Charles I took up his father's plans and erected the Baronetage of Scotland and Nova Scotia. The new baronets were each required to pay 2,000 marks or to support six settlers for two years. Over a hundred of these baronetcies, now familiarly known as Scottish baronetcies, have survived to this day. The Duke of Roxburghe is the Premier Baronet of Scotland and his baronetcy of Innes-Ker was created in 1625. As a result of the Union of England and Scotland in 1707 all future creations were styled baronets of Great Britain. With the Union of Great Britain and Ireland in 1801 new creations were styled as baronets of the United Kingdom. The position at 31 December 1999, including baronetcies where succession was dormant or unproven, was that there were a total of 1,314 baronetcies divided into five classes of creation included on the The Official Roll. Of these there were 146 of England, 63 of Ireland, 119 of Scotland, 133 of Great Britain and 853 of the United Kingdom. The Premier Baronet of England is Sir Nicholas Bacon, Bt whose senior title was created in 1611. Under the two royal warrants of 1612 and 1613 issued by James I certain privileges were accorded to baronets of England. Firstly, no person or persons should have place between baronets and the younger sons of peers. Secondly, the right of knighthood was established for the eldest sons of baronets (this was later revoked by George IV in 1827), and thirdly, baronets were allowed to augment their armorial bearings with the Arms of Ulster on an inescutcheon: "in a field Argent, a Hand Geules (or a bloudy hand)". 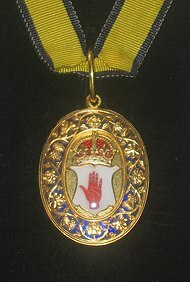 These privileges were extended to baronets of Ireland, and for baronets of Scotland the privilege of depicting the Arms of Nova Scotia as an augmentation of honour. The former applies to this day for all baronets of Great Britain and of the United Kingdom created subsequently. The revival of baronetcies can be dated to Sir Robert Cotton's discovery in the late 16th or early 17th century of Sir William de La Pole's patent (issued in the 13th year of Edward III's reign, ie. 1340), conferring upon him the dignity of a baronet upon payment of a fee. King James I established the hereditary Order of Baronets of England on 22 May 1611 for the settlement of Ireland. He offered the dignity to 200 gentlemen of good birth, with a clear estate of £1,000 a year, on condition that each one paid a sum equivalent to three years' pay for 30 soldiers at 8d per day per man into the King's Exchequer. The idea came from the Earl of Salisbury, who averred: "The Honour will do the Gentry very little Harm", while doing the Exchequer a lot of good. The Baronetage of Ireland was established on 30 September 1611. King Charles I established the hereditary Baronetage of Scotland or Nova Scotia on 28 May 1625, to fund his governance of Nova Scotia. After the Union of England and Scotland in 1707, creations of baronets of England or Scotland ceased, being replaced, for new creations, by the baronets of Great Britain. After the Union of Great Britain and Ireland on 1 January 1801 to create the United Kingdom of Great Britain and Ireland, all baronetcies created were under the style of the United Kingdom. Unlike knighthoods—which apply to the recipient only—a baronetcy is hereditarily entailed. The eldest son of a baronet who is born in wedlock succeeds to a baronetcy upon his father's death, but will not be officially recognised until his name is recognised by being placed on the Official Roll. With some exceptions granted with special remainder by letters patent, baronetcies are descend through the male line. A baronetcy is not a peerage, so baronets like knights and junior members of peerage families are commoners and not peers of the realm (nb. in the UK, all people save the Royal family and peers are considered commoners). According to the Home Office there is a tangible benefit to the honour of baronet: according to law, a baronet is entitled to have "a pall supported by two men, a principal mourner and four others" assisting at his funeral. Originally baronets also had other rights, including the right to have the eldest son knighted on his 21st birthday. However, at the beginning of George IV's reign, these rights were eroded by Orders-in-Council on the grounds that Sovereigns should not necessarily be bound by acts made by their predecessors. Baronets although never having been automatically entitled to heraldic supporters, were allowed them in heredity in the first half of the 19th century where the title holder was also a Knight Grand Cross of a Crown order. Baronets of England, Ireland, Great Britain or the United Kingdom (ie. all except baronets of Nova Scotia) can display the Red Hand of Ulster (sinister (left) hand version) as a heraldic badge, being the arms of the ancient kings of Ulster. This badge (or augmentation of honour) is blazoned as follows: Argent a Hand sinister couped at the wrist extended in pale Gules. King James I of England established the hereditary Order of Baronets in England on 22 May 1611, in the words of Collins' Peerage (1741): "for the plantation and protection of the whole Kingdom of Ireland, but more especially for the defence and security of the Province of Ulster, and therefore for their distinction those of this order and their descendants may bear the badge (Red Hand of Ulster) in their coats of arms either in canton or an escutcheon at their election". Since 1929 such baronets may also display the Red Hand of Ulster on its own as a badge, suspended by a ribbon below the shield of arms. ^ a b "Baronet". Collins Dictionary. n.d.. http://www.collinsdictionary.com/dictionary/english/baronet?showCookiePolicy=true. Retrieved 23 September 2014. ^ "Baronetess". Collins Dictionary. n.d.. http://www.collinsdictionary.com/dictionary/english/baronetess?showCookiePolicy=true. Retrieved 23 September 2014. ^ Debrett's Correct Form. Addressing the family of a Baronet. ^ a b Sir Martin Lindsay of Dowhill, Bt (1979). The Baronetage, 2nd edition. ^ "Baronetage decline since 1965". https://groups.google.com/forum/#!topic/peerage-news/NCaywWTirWw. Retrieved 21 September 2015. ^ "Baronial family von Friesendorff" (in sv). The House of Knights. http://www.riddarhuset.se/jsp/index.jsp?id=553&state=2&postId=162. Retrieved 30 November 2013. William Stubbs (1883). Chronicles of the Reigns of Edward I and Edward II, Vol. 2, Part IV - Vita Et Mors Edwardi II Conscripta A Thoma de La More. Longman & Co.. This page uses content from the English language Wikipedia. The original content was at Baronet. The list of authors can be seen in the page history. As with this Familypedia wiki, the content of Wikipedia is available under the Creative Commons License.